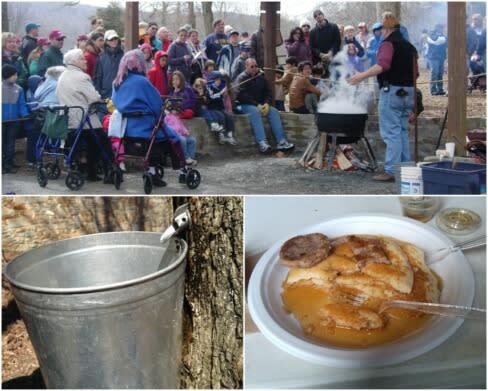 Winter is here and that means the Maple Syrup Festival in Thurmont is about to begin. The festival is held annually on the second and third weekends of March at the Houck Lake Area of Cunningham Falls State Park. Making maple syrup is a fascinating process that dates back in some form to the indigenous peoples in North America. It includes tapping trees to harvest maple tree sap, collecting gallons of sap in buckets, and boiling off the water to get sap that has been concentrated into maple syrup. All maple syrup has the same amount of maple sugar, but the maple flavor can differ and syrup can vary in color and taste throughout the sugaring season, as it is called. Each day of the Maple Syrup Festival visitors can enjoy live maple syrup demonstrations. The demonstrations begin every hour and continue throughout the day. Live music will be provided on both Saturdays and Sundays. Hot food is available including pancakes, sausage, sausage sandwiches, and hot dogs. Maple syrup products such as maple syrup, maple cream, and maple candy can also be purchased. A donation of $3 per person is requested to attend the Maple Syrup Festival, in lieu of the usual park entry fee. Youth group members are $2 and children in car seats are free of charge. All proceeds benefit Cunningham Falls State Park and Gambrill State Park through their Friends group. The festival is a cash only event.